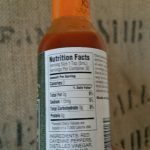 I bought a bottle of Cajun Sunshine Hot Pepper sauce the other day and thought I would add a review on it today. 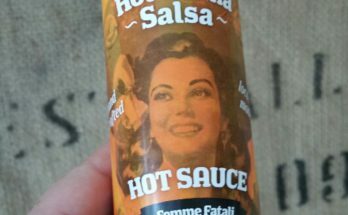 I have had this hot sauce before, but it has been a few years. In the back of my mind, I remembered it being something I liked, so I decided I better get a bottle and refresh my memory. It’s funny how certain hot sauces come in and out of my life, while others remain constant. 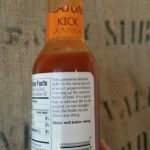 There have been times when I had a hot sauce that I totally loved, and then wasn’t able to find it again. Sadly, this has happened to me a few times, and the worst part is that now I can’t even remember the names of some of those long lost favorites. For the most part, this doesn’t happen anymore because of the internet. But there are a couple from several years back, before everything was available at our fingertips, that I feel I may have lost forever. I wasn’t really sure why I recalled frequently buying and having the Cajun Sunshine, but then for some reason stopped keeping it as a regular in my hot sauce arsenal. I am glad I went ahead and got a new bottle to figure out if I was missing a favorite from my past. After getting it home and giving it a taste I realized why I probably stopped buying it. 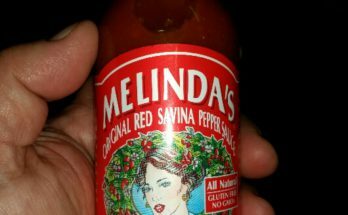 The flavor is very similar to Frank’s Red Hot Original hot sauce, except slightly less tangy and without any heat whatsoever. That would be good reasons for me to stop. My favorite part of Frank’s is the spicy tanginess. 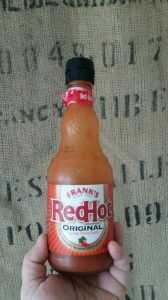 With that being said, if you find Frank’s to be too spicy, Cajun Sunshine may just be the sauce for you! It has a really good flavor, but I like a bit more power in my sauces. But for the wimpier people out there, this would be a great choice. 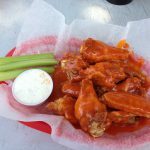 I am sure there are tons of people who want to enjoy the awesome taste of buffalo wings that just can’t handle the usual heat that goes along with it. Often times I find, at restaurants, that if you don’t want the standard Frank’s style buffalo wings, then you are left with options like honey bbq or some other totally off the wall flavors. Of course, some of these non traditional wings varieties can be really tasty, but what if you want the original flavor that everyone else gets to enjoy without all the heat? Well, here you go! Get yourself some Cajun Sunshine Hot Pepper Sauce. Don’t let the name scare you, it is not spicy. I let my spicy intolerant girlfriend try it, and she loved it. She said, “It tastes like Frank’s, but it’s not hot!” See, told ya so! Today’s hot sauce review is kind of short, but I think that’s pretty much all there is to say. 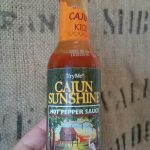 If you have ever tasted regular buffalo wings and liked the flavor, that is basically what Cajun Sunshine tastes like. So, if you have ever wished for a less spicy version, get yourself some chicken wings, and pour on some Cajun Sunshine! Don’t be shy, let pour. Cover that wing in saucy delight, get some napkins ready and dive in! Well, I hope this was helpful. As always, if you have any questions, comments, or suggestions, I would love to hear from you! Please feel free to leave a comment below. 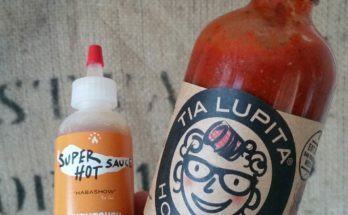 Also make sure to check out my other hot sauce reviews and stop by my Hot Sauce Shop to see all my favorites on one page. If you want to get yourself, or someone else, a bottle of the Cajun Sunshine I put a picture above this sentence that is a link to this hot sauce on amazon.com. I could only find a 3 pack, but it is a actually a really good deal. And if you plan to make some hot wings with it you will probably want more than one of these 5oz bottles anyway. That is why the Frank’s comes in 12oz bottles, because you need enough to make a nice saucy batch. Anyhow, good ahead and check it out for yourself. And enjoy those buffalo wings!! We are a participant in the Amazon Services LLC Associates Program, an affiliate advertising program designed to provide a means for us to earn fees by linking to Amazon.com and affiliated sites. 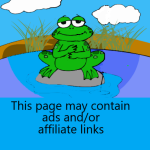 Purchasing through any provided links supports our cause and has no effect on the cost of products or services. Thank you for your loyal readership.